Borges may not be convinced by the philosophical speculations that intrigue him, and he may caution against their danger, but they do appear to afford him solace. The philosophical ideas he uses is precisely the same ideas that constitutes the Matrix Conspiracy. In this article I will show how Borges uses these ideas in his fictions, and the relation to the Matrix Conspiracy. Borges was not a philosopher, and never considered himself to be one. His father was particularly interested in metaphysics and introduced the young Borges to the basic tenets of idealism, as well as to Zeno the Eleatic´s paradoxes. As a youth in Switzerland Borges learned German and, after finding Kant intractable, read for the first time the philosopher whom he would come to regard above all others, Schopenhauer. He subsequently read, or read about, many major thinkers, claiming in later life that there was a good deal in their writings that he did not understand and describing himself, in “A New Refutation of Time,” an “Argentine adrift on a sea of metaphysics”. Largely self-taught, he acquired a broad knowledge of philosophy from general guides, such as Lewes´s Biographical History of Philosophy, Mauthner´s Wörterbuch der Philosophie (Dictionary of Philosophy), and Russell´s History of Western Philosophy, from reading works of the philosophers themselves, and from discussions with his father´s friend Macedonio Fernández. Nevertheless, he returned time and again to the same thinkers – Heraclitus, Zeno, Plato, Spinoza, Berkeley, Hume, Schopenhauer, and Nietzsche – and to the same, predominantly metaphysical, problems: substance (matter and reality), time, identity, the limits of human understanding, language, infinity, eternity, death, causality, determinism and chance, and the question of design in the universe, as well as to mathematical and theological questions (he was particular interested in Buddhism and in Swedenborg´s mysticism). He published a number of essays on philosophical issues, the longest and best known being “A New Refutation of Time,” and he planned a book on Spinoza which he never wrote. He included philosophical meditations, notably “The Nothingness of Personality” and “Berkeley´s Crossroads,” in his first book of essays, Inquisitions, which appeared in 1925, several years before he published any fiction. He famously admitted that he tended to be “interested in religious or philosophical ideas for their aesthetic value an even for their strange and marvellous elements,” and had some of his invented philosophers treat metaphysics as “a branch of the literary of fantasy.” Rather than using his stories as vehicles for philosophical ideas, he often used those ideas as a starting point for fiction, and the literary use he made of them is more important than the ideas in themselves. Without foundation, purpose, weight or shape. I would like to tell you the story of my life. It is first by now I, as Karen Blixen could have put it, can begin to see the dream-tracks and songlines in the artwork of my life. By now I, seen with collective and universal eyes, consider it as a philosophical journey, that began in the dawn of time, before this universe. Anyhow, seen with the personal eyes, the memory of my philosophical journey goes back to when I was 5 years old. Here I started to reflect over, whether life is a dream. This philosophical question has always followed me: whether we sleep, whether we dream this long dream, which is life? Therefore my adolescence has always been accented by a strong wonder over life, and a strong longing after something inexpressible, after something that can´t be satisfied by explanations and interpretations - perhaps a longing after awakening. However I was never lead to connect this with philosophy, and therefore I first started an actual education in philosophy quite late. When I was a child I had many speculations over what happened to my family when I was not in the same room as they were. How did the room look like when I was not there? Was there any objective reality present there? I could also ponder whether all other people were actors in a theater, having an experiment with me, just like the American movie The Truman Show, where Jim Carrey plays Truman Burbank, adopted and raised by a corporation inside a simulated television show revolving around his life, until he discovers it and decides to escape. I´m also convinced that the thought by nature is idealist. Thoughts work in language. Language is most condensed in the spoken, communicated language: words, sentences, opinions, conversation. This is the subject-field, which primarily is characterized by personal images, but which accordingly originates from collective and universal images. This is what we normally refer to as the subject, or the mind (the thoughts). And this is also where the idealists belong. In fact, they are ending in solipsism. Solipsism is the philosophical idea that only one's own mind is sure to exist. As an epistemological position, solipsism holds that knowledge of anything outside one's own mind is uncertain; the external world and other minds cannot be known and might not exist outside the mind. As a metaphysical position, solipsism goes further to the conclusion that the world and other minds do not exist. New Age is building on such kind of Berkeleyan idealism, and is confusing idealism with the Eastern concept of Maya (the world as illusion). The same confusion is seen in the notion that Eastern philosophy and spiritual practice must be integrated with [reduced to] Western psychology and psychotherapy. The danger is, that when New Age is speaking about the enlightened consciousness they are speaking about metaphysical solipsism: the complete subjectivism. I have called this black enlightenment (see my Matrix Dictionary entry on A Course in Miracles). But the concept of illusion (Maya) has to do with the impermanence of nature, as well as thought distortions. It hasn´t anything to do with reality as a complete mental construct. Buddhism, for example, is a kind of metaphysical naturalism, and in connection with metaphysical solipsism it must be said to be the direct opposite: the complete objectivism. But there certainly are many similarities, because Buddhism also starts in the subject with its thought distortions. Thoughts work in language. Language in the object-field is like the atmosphere, which refines and thinner itself outwards: atmosphere – stratosphere – ionossphere; weightless floating in space – full outlook to the blue globe and the stars. The structure of language is the images in time; both the personal, collective and the universal images. The collective and universal images are lying in the object-field almost as a vast refined organic unity. Your thoughts are words and images, which work in this stream. It is the River of Heraclitus; it is the River of Time. We can observe how the thinking divides everything. It separates large from small, outside from inside, up from down. The inner reality is divided in feelings and emotions, thoughts, sensations and intuitions. And the individual feelings are divided in hate against love, lust against pain. The outer reality is divided in the observer and the observed, the listener and the sound, the speaker and the spoken. In order to be able to function at all, the thinking differentiates the world in two: subject and object. The thinking (and therefore the ordinary mind) is dual. I will return to the importance in realizing this fact. But thinking is by nature trying to construct reality, to overcome the conflict dualism creates. Like Sisyphos it keeps on trying to overcome the dualistic conflict. It is obsessed with trying to control everything. It is by nature idealist. But in the attempt to overcome the dualistic fact, idealism creates the thought distortion Cognitive Dissonance (a well as many other thought distortions). Cognitive dissonance is a discomfort caused by holding conflicting ideas simultaneously. The theory of cognitive dissonance proposes that people have a motivational drive to reduce dissonance. They do this by changing their attitudes, beliefs and actions. Dissonance is also reduced by justifying, blaming and denying. An overarching principle of cognitive dissonance is that it involves the formation of an idea or emotion in conflict with a fundamental element of the self-concept, such as “I am a successful/functional person”, “I am a good person”, or “I have made the right decision.” The anxiety that comes with the possibility of having made a bad decision can lead to Rationalization, the tendency to create additional reasons or justifications to support one´s choices. In close coherence with these aspects of thinking exists language. The thinking functions in language. And language is not only words and sentences. Language is music, mathematics, myths, archetypes, symbols, signs, etc. Language and thinking carry each other. And the collective history is so to speak lying in nature in the form of projected energy. The universal history though, is not projected energy, but is lying beyond Man, it is the actual foundation for the creation of the universe, it is the great vision, God´s plan you could say, the dreaming tracks and songlines in the artwork of the universe and of Man. It works in synchronism with the Now, and therefore with life itself, and not projected in past and future. The spiritual practice is about exploring, changing and restructuring thought distortions, whereby the subject opens more and more up towards the collective and universal images, which, in relation to the subject, is objective entities (relatively valid dreams). You could say that spiritual practice is about overcoming the philosophical idealism of the thought. In spiritual practice it is not the subject that are sleeping, dreaming, and awakening; it is the wholeness that are sleeping, dreaming and awakening. It is a negation of the thought. The less thought, the more objectivity, which is the same as presence in the now. New Age follows the direct opposite path. It is a position of the thought, the idea that you can create yourself and the world in accordance with your will. Therefore the practice of positive thinking; positive thought construction of yourself and the world. But no matter how much use of the word “positive”: the ultimately worship of the thought leads to solipsism. I don´t know if you, the reader, can sense the horror here. Strangely enough New Agers find this extremely exciting. I will return to the aspect of horror. The speculation that the material world does not exist outside the mind of the perceiver (solipsism) underlies many of Borges´s stories. In “The Shape of the Sword” John Vincent Moon misleads the narrator and the reader by maintaining that he was the victim of treachery when, it transpires, Moon himself was the traitor. He is a liar: the story he tells does not reflect any reality outside his own mind, and so it come as no surprise to learn that the farm on which the events of his story take place is owned by a fellow Irishman called Berkeley (the philosopher George Berkeley was Bishop of Cloyne, in County Cork, Ireland). In “Averroës’ Search” Borges tries to conjure up the medieval Arab philosopher Averroës, but is aware that this Averroës is merely a shallow product of his mind and so, when he ceases to imagine him, Averroës simply disappears. Even though Borges´s characters may think that they are real, they can turn out to be the figment of others´ imaginations. For example, the magus of “The Circular Ruins” dreams into existence a son, hoping to conceal from this invented offspring his invulnerability to fire, which would alert him to his fictiveness. However, when a fire breaks out, the magus discovers that he, too, is invulnerable and must be a product of somebody´s else´s dream. Dream and reality can merge in Borges´s stories, so that any notion of an objective reality outside the mind is questioned. This is what happens in “The Wait” where the character who adopts the name Villari incorporates his pursuers into his dream. In a more enigmatic tale “The South,” we are never certain whether Juan Dahlmann dies in the gaucho knife fight that, as a second-generation immigrant, he conceives as being a truly Argentine death or whether such an end was the effect of hallucination as he lay dying in an operating theatre in Buenos Aires. In his earliest essays, such as “The Nothingness of Personality”, Borges challenged the notion of the self, and a continuing desire to do so runs through much of his writing. His argument starts from Berkeley and leads on to Hume´s more radical conclusion: if, as Berkeley maintained, the world exists only insofar as it is perceived, then the mind exists only as a series of successive acts of perception. This casts doubt upon any continuum of identity we could call the “self” lying behind those momentary and shifting perceptions, and has direct consequences for Borges´s fiction. He is sceptical of psychology – in particular that of Freud – which he associates with the nineteenth century and realist novels: if the very notion of identity is unfounded, then psychology is an empty study. Such an argument provides a philosophical basis for Borges´s stated antipathy toward psychological portraits in literature and the scarcity of credible individuals among Borges´s own characters. This antipathy can be seen in several ways in his stories. First, Hume´s argument that we are merely a series of perceptions is illustrated by the Mayan priest Tzinacán of “The Writing of the God,” who is depicted as clusters of apparently random perceptions when he undergoes a mystical experience. Second, while authors often use names to characterize or particularize their creatures, many of Borges´s figures share the same ones: for example, Otálora in “The Dead Man” and Otálora in “Ulrikke”; Nolan from “The Other Duel” and “The Theme of the Traitor and the Hero”; Runeberg in “Three Versions of Judas” and “The Garden of forking Paths.” Third, he sometimes leaves his characters´ names vague: the brutish brothers of “The Interloper” are the Nelsons or the Nielsens; the narrator of the story “The Encounter” cannot remember whether one of the characters is called Acevado or Acébal; the “real” name of the corrupt British official in “The Man on the Threshold” is kept from us, the narrator choosing to refer to him as David Alexander Glencairn because the names David and Alexander are symbolic of ruthless rulers. Fourth, some characters exist only insofar as they are doubles or rivals of somebody else rather than having any being in their own right. Although the two enemies in “The Theologians” believe that the theological opinions which characterized them are so different that one has the other burnt as a heretic, God is unable to distinguish between them. Finally, the archetypical nature of many of Borges´s characters is all of a piece with his questioning of identity, as well as recalling his interest in Platonic archetypes. Baltasar Espinosa, of “The Gospel according to Mark,” is not only “a Buenos Aires youth like so many others”, but a reincarnation of one example of the self-sacrificing god, Jesus, whose fate we are led to believe Espinosa will share. Perhaps the most striking example of his portrayal of characters as archetypes is to be found in the stories “The South” and “The Man on the Threshold” where Borges uses exactly the same words to describe two old men, one an archetypical gaucho and the other an archetypical Indian. He draws our attention to this by emphasizing on both cases that his description is “essential” in the sense both of important and describing an essence. His speculations on pantheism, reflecting his reading of Spinoza and Schopenhauer, lead to a further dissolution of identity as he suggests that all men are one man, and one man all men. 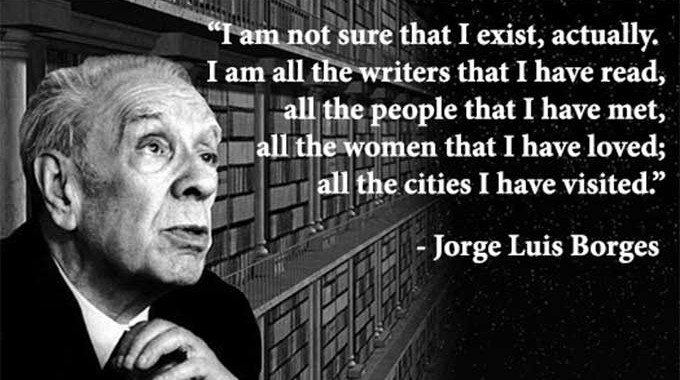 Again, philosophical speculation not only underlies Borges´s own practice, but also his more general theories about literature. His questioning of self parallels a downplaying of the importance of authors and their lives, stressing from his ultraísta period onward how unimportant are the innovations introduced by any author and how much literature owes to tradition. He concentrates instead on texts and how they are read. So in “Pierre Menard, Author of the Quixote,” emphasis is one more laid on the reader´s role in forging meaning in the text. But, as mentioned, Borges´s stories also reflect the Horror of idealism. They play with all the paradoxes, philosophical puzzles and logical problems, which idealism create. I begin my article on A Course in Miracles with the words: “WARNING! In this article I will give you a glimpse of Hell!” A Course in Miracles is one of, if not the, most popular spiritual texts of The New Thought tradition (see my article The New Thought Movement and the Law of Attraction). A Course in Miracles (ACIM) is precisely the name of a book, allegedly dictated by Jesus to Helen Schucman, an American research psychologist. The book explains what Jesus really had in mind when he came to save the world. The popularity of Schucman´s book gives testament to the attractiveness of New Thought´s revisionist biography of Jesus as wanting more love and forgiveness (positivity), and less suffering and sacrifice (negativity). In looking at the suffering in the world the Course says that this world cannot be created by a God. Heaven awaits us all and there is no hell; that is: the prompting to deny and ignore suffering and negativity. This is probably the best trick an Antichrist could impose in us: that hell and evil don´t exist. An example of the paradoxical nature of the Devil´s game, which I have investigated in my book Lucifer Morningstar – a Philosophical Love Story. According to this, Man is still in heaven. It is simply the illusion of sin and death that have caused false senses of reality. Therefore all these wars, crimes, calamities, pains and sufferings are figments of our imagination and are not real. A Course in Miracles also teaches that evil does not exist [as mentioned: that´s a good idea for the Antichrist at least]. It is an illusion that must be overcome by right thinking. According to the Course pain and suffering are illusory. They are only in the imagination of the person who is suffering. “YOU are the dreamer of the world. You, singularly and individually (but not personally as a separate entity, as that "you" is illusory), are dreaming the entire universe of pain and suffering, sickness and death." There you are. Blaming the victim put into a religious system. Freud has not lived in vain. The paradox is that this blaming-the-victim logic has replaced the concept of sin with something much worse. Because - and now to the horror - Is it true? If we stop “dreaming” about terrorism, wars or the natural disasters do they go away? What this explanation in fact are claiming, is that you are responsible for all the evil things going on in your world because you are dreaming them. So all you have to do is stop dreaming and your world will become a paradise. Looks like according to this doctrine each one of us is the writer and the director of this universe. A universe that exists nowhere but in our own minds. All we have to do is to change our dreams and the world will change accordingly. It´s as simple as that, as ACIM and the New Thought movement claim. Well, if it is that simple why is it that none of the supporters have succeeded in changing the world? The horror is that the thought is false. Like Byron Katie, A Course in Miracles teaches that there are no absolutes; truth is relative and is determined by one's experience. According to the Cyclopedia in A Course In Miracles, "only what is loving is true." The Course has therefore no basis in an objective truth. Personally, I believe Schucman was genuinely channeling some subtle-plane entity who was very much in love with pompous-sounding New Thought material. I also believe the entity was a demon, or even the Antichrist himself, considering the ingenuity of the book. In other words: I believe we are talking about a very special case of the type of spiritual crisis called Possession State. Why should anyone believe that the words of Helen Schucman are the words of Jesus? Did she give any proof for that claim? Absolutely none. She expects people to believe in her claim and take her for her words. How could we know that she told the truth? We can´t. Furthermore: the thought is self-refuting: idealism itself denies any objective truth, and can therefore not itself claim to be true. But the thought is dangerous. If all truths are subjective they must be considered equally true. This means that idealism can be used to justify just about any idea. Both subjectivism and relativism claim that objective truth doesn´t exist. Truth is something we create ourselves, either as individuals or cultures, and since objective truth doesn´t exist, any objective scale of truth doesn´t exist either. All truths are therefore equally true and equally valid, and if one person´s truth, or one culture´s truth, try to intervene in the truths of other individuals or cultures, then this is considered as an aggression. But this leads to yet another thought distortion: Reductio ad Absurdum. If you for example preach relativism and believe that everything is relative and for that reason equally true, you have thereby accepted that nazism, fascism, dictatorship, popular murder, terror and violence, are as equally great blessings for mankind as democracy, negotiation and dialogue. Then you have no basis in order to criticize, because you haven´t got any rational frame to start from. You can´t criticize anyone for argumentation bungling, or to replace arguments with machine guns, because this presupposes, that there is a rational foundation in your arguments. We will return to this in the end of this article. That people without hesitation take Schucman´s words as being the words of Jesus says something about the authority, which the concept of channeling has within New Age. As I demonstrate in my article The Fascism of Theosophy, and its follow-up The Philosophy of Krishnamurti – then unenlightened channelers are often taken as greater authorities than the enlightened masters themselves. In the case of Helen Schucman: she is obviously taken as a greater authority than the whole of the history of Christianity itself, with all its historical sources, and the Saints and mystics, whose lives and teachings have confirmed this. All this for one reason: because she claims she is a channeler. But there is of course also another reason: the temptation in the desert. The teaching is a tempting teaching. But! The idea that the world doesn´t exist when you´re not there to observe it, is purely subjective idealism; that is: metaphysical solipsism. Metaphysical solipsists maintain that your own mind is the only existing reality and that all other realities, including the external world and other persons, are representations of that mind, and have no independent existence. It´s an incredible easy idea to debunk (again: see my Matrix Dictionary entry on Simulation theory). Moreover: it is an extremely frightening thought, which can be compared with the horror of Borges´s stories. It is a vision of Hell that wants something: you yourself have to simulate infinity each and endless moment in an infinite past and infinite future. You have no family, no friends, no other humans to support you, and no other existence at all, except yourself and your Sisyphean mind-work that each and every moment in an endless past and an endless future has to simulate every atom in the whole endless universe in an endless ongoing Time, where there is no rest, no death, no end. And - (just to add one more reason to the thousand other reasons why you should abandon the idea) - there is no reason at all to share the idea because there is no one to share it with. Borges's short story "Funes the Memorious" is the tale of one Ireneo Funes, who, after falling off his horse and receiving a bad head injury, acquired the amazing talent—or curse—of remembering absolutely everything. The story trace the theme of infinity found in several of Borges' other works, for example “The Aleph” and "The Book of Sand". Borges is fascinated by what I have called thought distortions, especially my thought distortion Endless Split of the Thought. I believe that Helen Schucman, like Funes, ended in metaphysical solipsism, or black enlightenment. She confused her thoughts with reality, or the wholeness (the Universe), and that splits the thought in infinity. So, the Horror which Borges describes many times, can be seen in particular two thought distortions: Endless split of the Thought, and Illusion of Control. In the following I will describe these two thought distortions, and I will write connected thought distortions in bold, so that you can find them in my book A Dictionary of Thought Distortions. The endless split of the thought implies the so-called polarization-problem. Reality seems to be an Otherness which determines and defines the world – that is: a negation-principle. The negation power is a horror for an idealist. Any concept, anything, is defined by its negation; that is to say: what it not is. A dream can for example only be defined from what it not is. It is for example not reality. How can you for example assert that life, or reality, is a dream, unless you know what a dream not is? What is the good? This you know if you know what the evil is. This logic seems to be impossible to get around. You can see the logical problems manifested in a nightmare. When you in a nightmare are forced to confront the negations, but at the same time don't practice realizationwork and ethical practice in your awaken life, the nightmare will be characterized by contradiction and split. It is this duality which creates the horror in the nightmare; that is: your Cognitive Dissonance. An idealist must entirely rely on his mind (thoughts), which by nature is limited to what can be thought or imagined; that is: what can be perceived. So everything that negates this creates horror: the unlimited, the unknown, the unimaginable, the inexpressible, the unperceivable. The paths and the locations in a nightmare can imply two types of horror. The one horror lies in the paths. Each point on a path is determined by the negation of the point, which itself is determined by a third negation etc. The path constitutes in other words a series of points with no end. The points themselves are limited extents. This means, that there never will come a time, where you will get out over the limited points. On the path you become forced from point to point without ever being able to reach the unlimited, this endless, which would bring the path to an end. And yet the path is endless. I will return to how Borges is using this in his stories. The second horror lies in the locations. When each location is determined by the negation of it, this means, that it might well be, that the location is divided from its negation, but nonetheless identical with it. This means, that each location is an endless number of locations, an abyss of worlds, countless, swarming, branching off to all sides in labyrinths, yet without that the worlds ever become mixed together. Labyrinths is one of Borges´s central metaphors. Indeed, the concept of infinity is probably the central horror in Borges´s stories. You can see it illustrated in many different ways. You can also see it in M.C. Escher´s works, or in the movies by David Lynch. The weak nihilists break down, when they realize the meaninglessness in the eternal recurrence, while the Superman on the contrary ”insatiable shouts Da Capo, not only to themselves, but to the whole play and acting”. In fact it is the same type of split you can experience, when you are looking up towards the stars and become captured by this wonder over infinity. How can it just go on and go on? I guess all people, especially children, have had this thought. The thought can´t stop. It might think of a wall that ends it all. But then it continues with the thought about what´s behind the wall. The same with the Big Bang theory. What was there before the Big Bang? But it is due to magical thinking, the lack of discrimination between the thought and reality itself. Something, which by nature is limitary, namely the thought (the perception), seeks to grasp the unlimited (the unperceivable). Something, which by nature is expelling, seeks to grasp the all-inclusive. It results in a feeling of endless split, which again results in a lot of logical anomalies, paradoxes and problems. And it is these logical problems which are lying underneath the thought distortions, for example Dichotom Thinking and Catastrophe-thinking, and therefore underneath a lot of inappropriate assumptions and rules of living. It is precisely these logical anomalies, paradoxes and problems, which create Samsara´s wheel of eternal repeating up-cycles which is followed by eternal repeating down-cycles and vice versa (for example life and death, success and fiasco, joy and sorrow) – as well as the ignorance and the suffering when you are caught into this wheel, for example in the experience of nightmare and anxiety. All Borges´s stories are about these logical and philosophical problems. His stories are filled with mirrors, masks, infinite series and regresses, labyrinths, doppelgängers, time travel theories, other dimensions, parallel universes, solipsisms and dreams. About solipsism and endless regress, see my article The Dream Hypothesis and the Brain-in-jar Hypothesis. About theories of everything, see my article Quantum Mechanics and the Philosophy of Niels Bohr. About Time travel see my article Time Travel and the Fascism of The WingMakers Project. An idealist must believe that you can control everything via your thought (perception). Berkeley was actually aware of the problems in this. Berkeley believed that the concept of God could solve this problem. A convinced adherent of Christianity, Berkeley believed God to be present as an immediate cause of all our experiences. He did not evade the question of the external source of the diversity of the sense data at the disposal of the human individual. He strove simply to show that the causes of sensations could not be things, because what we called things, and considered without grounds to be something different from our sensations, were built up wholly from sensations. There must consequently be some other external source of the inexhaustible diversity of sensations. The source of our sensations, Berkeley concluded, could only be God; He gave them to man, who had to see in them signs and symbols that carried God's word. “Whatever power I may have over my own thoughts, I find the ideas actually perceived by Sense have not a like dependence on my will. When in broad daylight I open my eyes, it is not in my power to choose whether I shall see or no, or to determine what particular objects shall present themselves to my view; and so likewise as to the hearing and other senses; the ideas imprinted on them are not creatures of my will. There is therefore some other Will or Spirit that produces them.” (Berkeley. Principles #29). The question Berkeley must face is that if everything only is a perception, then God also must be a product of your own perception. Berkeley can´t answer this question. Well, he can, but not with a philosophical argument, only with a religious postulate. And a religious postulate can´t be accepted in a philosophical discussion (such a religious postulate you can see many variations of in New Age, often changed into some kind of pseudoscientific theory). You could with the same weight say that an evil demon is the cause of our perceptions. That´s what Descartes claimed. And that´s also the Horror Borges is talking about (note that using religious postulates doesn´t rule the notion of God, or some kind of spiritual source out, in philosophy. One must just be able to apply the notion with a philosophical argument). Is there any harm in this? What´s the harm in obliterating truth and reality in favor of what you want to be true? A great deal of harm can come from deluding yourself that you can control your health, spiritual development and your wealth, or somebody else´s health, spiritual development and wealth, with your thoughts and prayers or other superstitious actions. In my article The Value of Having a Religion in a Spiritual Practice I describe that only an intervention from the source can basically help Man with a transcendence of the negative karma of the original sin. [Note! In order not to end in a religious postulate, but to obtain a philosophical argument, I describe concepts of the source of everything – (God, Christ, the enlightened consciousness) - as a Negation power, an Otherness, or simply The Wholeness. In metaphysics I support some kind of metaphysical naturalism. And in epistemology I support some kind of gnoseological, or epistemological dualism, which, through spiritual practice, can be developed into a non-dual experience of the Wholeness (about that: see my article Quantum Mechanics and the Philosophy of Niels Bohr). The Wholeness is in the end undescribable, because it can´t be put in opposition to anything (that´s why you can´t make a theory of everything). In other words: The Wholeness is far beyond our control. In order to describe the personal, collective and universal images beneath the thinking, I´m also supporting some kind of mythology based on Joseph Campbell´s monomyth – see my article The Hero´s Journey and my pop culture file on Star Wars]. But in order to be able to receive this help you must do your part of the work: the spiritual practice. Many years. And this means that you need to re-structure the ego´s ownership to things, food, personal power, sexuality and emotions. Spiritual practice is in all simplicity about separating and dismantling the consciousness´ automatical identification with all this, in order to turn the consciousness in towards its source. First thereafter the mystical process can begin. The magnet of attraction, which the ego is controlled by – (the ego´s identity with the material world: instincts, sexuality, emotions, desire, collective ideals, ownership, personal power) – will in a true spiritual practice lose its attraction. Investments in the material world´s ups and downs, its demands, temptations and dramas, become undramatized, uninteresting, even meaningless, in relation to the consciousness´ opening direction in towards its spiritual essence: the now, the wholeness, life itself, and finally: the eternal otherness, from where the good, the true and the beautiful are streaming as grace and forgiveness. Another aspect of the true spiritual practice is that you break the automatic process of compensatory karma which is closely related to the material world, laws of nature, cycles of life, yes actually pure causal regularity of mechanical kind. It would be an illusion to connect such things with a superior intentional divine order (see the thought distortion Intentionality bias). In Taoism and Zen they talk about the concept of Wu Wei, which means non-activity, passive listening presence, non-control, non-interfering, which lead to Tzu-jen, spontaneity and naturalness. In Zen they for example talk about that when practicing Wu Wei you are letting the grass grow by itself. Also the Stoic concept of Apátheia (the Stoic calmness) is about this - which you by the way find in all wisdom traditions. So, it is puzzling that they in the New Thought movement often quote these wisdom traditions as if the New Thought ideology is in perfect harmony with these. The fact is that New thought is an extreme example of the illusion of control, when believing that you via the "power of thought" can attract (control) everything you can dream of. “In all of these words there is an idea of demonic origin, the idea of a demon who causes the nightmare. I believe it does not derive simply from a superstition. I believe that there is – and I speak with completely honesty and sincerity – something true in this idea. “Let us enter into the nightmare, into nightmares. Mine are always the same. I have two nightmares which often become confused with one another. I have the nightmare of the labyrinth, which comes, in part, from a steel engraving I saw in a French book when I was a child. In this engraving were Seven Wonders of the World, among them the Labyrinth of Crete. The Labyrinth was a great amphitheatre, a very high amphitheatre (and this was apparently because it was higher than the cypresses and the men outside it). In this closed structure – ominously closed – there were cracks. I believed when I was a child (or now I believed I believed) that if one had a magnifying glass powerful enough, one could look through the cracks and see the Minotaur in the terrible center of the labyrinth. “My other nightmare is that of the mirror. The two are not distinct, as it only takes two facing mirrors to construct a labyrinth. I remember seeing, in the house of Dora de Alvear in the Belgrano district, a circular room whose walls and doors were mirrored, so that whoever entered the room found himself at the center of a truly infinite labyrinth. “I always dream of labyrinths or of mirrors. In the dream of the mirror another vision appears, another terror of my nights, and that is the idea of the mask. Masks have always scared me. No doubt I felt in my childhood that someone who was wearing a mask was hiding something horrible. These are my most terrible nightmares: I see myself reflected in a mirror, but the reflection is wearing a mask. I am afraid of to pull the mask off, afraid to see my real face, which I imagine to be hideous. There may be leprosy or evil or something more terrible than anything I am capable of imagining. I think Borges here tells us something very common to all ordinary dreams. The thought (the dreamer) is lost in an endless split, and it tries to control the situation without luck. The horror is the negation, the mirror. The content of the dream will normally be about childhood, your hometown, your school, the time where you lost the innocence of childhood, and the painbody was created - in all kinds of variations. All characterized by that you try to find your way; either concrete as a search for the way home, or as an attempt to figure out how to manage situations. Without luck. The painbody is the material for the dreams. If we want to enter into unordinary dreams (like Blixen´s), we must let go of our will to power (see my blog post On The Nature of Dreams). When Borges had recounted two of his own nightmares, he describes two nightmares from literature, which he consider were real. The one is the Nobile Castello which Dante imagined in the Inferno. The Nobile Castello is a noble castle. It is encircled by seven walls that may be the seven liberal arts of the trivium and the quadrivium or the seven virtues. He speaks of a river that disappears and of a fresh meadow that also disappears. He speaks of those who inhabit the noble castle: they are the great shades of the pagans, and of the Moslems too. They all speak slowly and softly, they have faces of great authority, but they are deprived of God. There is the absence of God, which will say the presence of the negation. They know they are condemned to that eternal castle, to that castle that is eternal and honorable, but terrible. He falls asleep in the cave, facing the sea, amid the golden sands of the beach. In his dream he is also surrounded by sand, a Sahara of black sand. There is no water, there is no sea. He is in the middle of a desert – in the desert one is always in the middle - and he is horrified at the thought of trying to escape. Suddenly he sees there is something next to him. It is, oddly enough, an Arab of the Bedouin tribes, mounted on a camel and with a lance in his right hand. Under his left arm he has a stone, and in his hand he holds a shell. The Arab tells him that his mission is to save the arts and sciences. He brings the shell to the poet´s ear; the shell is of an extraordinary beauty. Wordsworth tells us he hears a prophecy “in an unknown tongue which yet I understood”: a sort of tender ode, prophesying that the earth was on the verge of being destroyed by a flood sent by the wrath of God. The Arab tells him that it is true, the flood is coming, but that he has a mission: to save the arts and sciences. He shows him the stone. And the stone is, curiously, Euclid´s Elements, while remaining a stone. Then he brings the shell closer, and the shell too is a book; it is what had spoken those terrible things. The shell is, moreover, all the poetry of the world, including – why not? – the poem by Wordsworth. The Bedouin tells him that he must save these two things, the stone and the shell, both of them books. He turns around, and there is a moment in which Wordsworth sees that the face of the Bedouin has changed, that it is full of horror. He too turns around, and he sees a great light, a light that has now flooded the middle of the desert. It is the waters of the flood that will destroy the earth. The Bedouin goes off, and Wordsworth sees that the Bedouin is also Don Quixote and that the camel is also Rosinante and that, in the same way that the stone was a book and the shell a book, so the Bedouin is Don Quixote and is neither of the two and is both at once. This duality [the Cognitive Dissonance] corresponds to the horror of the dream. Wordsworth, at that moment, wakes with a cry of terror, for the waters have engulfed him. Borges thinks that this nightmare is one of the most beautiful in literature. So, we see how Borges, when seeing the beauty in philosophical idealism, at the same time also sees the horror in it. In that way horror also can be beautiful, well, in fact, the most beautiful poetry is about loss and suffering. Therefore he applies idealism to literature, but not to the objective world. Despite his reputation as an erudite weaver of philosophical puzzles, the focus of much of Borges´s life and work is the popular or even the vulgar: the gaucho code; detective stories and other genre works; classical Hollywood movies; tangos; and so forth. However, Borges´s engagement with what is nowadays called popular culture is very selective. There is, for example, little about soccer or other sports in his work, the disdain for mass movements is palpable (often in form of virulent anti-Peronism), and the attitudes to the folkloric or displays of earthy sexuality are distinctly ambiguous. Yet this ambiguity is crucial. The distinction between “high” and “popular” culture is really a false one, and the categories are increasingly seen as porous. Indeed, it is my view that it is precisely in this undecidability that the appeal of Borges as a writer of literature lies. He is tantalizingly and provocatively “in-between,” or, as Beatriz Sarlo would put it, “on the edge,” in the shady yet unspeakably alluring territory of popular culture. There are three lines too many in your labyrinth…I know of a Greek labyrinth that is but one straight line. So many philosophers have been lost upon that line that a mere detective might be pardoned if he became lost as well. When you hunt me down in another avatar of our lives, Scharlach, I suggest that you fake (or continue) one crime at A, a second crime at B, eight kilometres from A, then a third crime at C, four kilometres from A and B and halfway between them. Then wait for me at D, two kilometres from A and C, once again halfway between them. Kill me at D.
This “Greek labyrinth” is not a physical but an intellectual one [we have looked at it in the thought distortion Endless Split of the Thought]; it alludes to Zeno´s dichotomy paradox which denies the possibility of motion. As Borges explained it in “Kafka and His Precursors”: “A moving body at point A…will not be able the reach point B, because it must first cover half the distance between the two, and before that, half of the half, and before that, half of the half of the half, and so on to infinity”. The paradox lies in our knowing that this defies common sense (something idealists love), yet the premise on which it is based makes it difficult to disprove. Although Borges´s stories are not parables from which an unequivocal message can be deduced, any more than the famous metaphors he uses in them – labyrinths, mirrors, libraries – are symbols that can readily be deciphered, in “Death and the Compass” it is Lönnrot´s erroneous premise at the beginning of his investigation that determines its development and its fatal outcome. But how can a detective begin to investigate a crime, or a philosopher a problem, without starting from a premise, without treating some pieces of evidence as irrelevant and others not? The opposite situation is to be found in “Funes, The Memorious,” where Funes accumulates facts and impressions without prioritizing or categorizing any of them. As the narrator point out, Funes cannot abstract, cannot see the wood for the trees, and he is therefore incapable of thought. Borges offers no solution to the argumentative bind evolved in these two stories, but merely presents it. This parallels his recourse elsewhere to paradox as a response to insoluble intellectual problems. A somewhat similar idea is posited in a footnote which appears in the story “Tlön. Uqbar, Orbis Tertius”: the hypothesis borrowed from (and rejected by) Russell that the world sprang into being five minutes ago, peopled by those who “remembered” a wholly unreal past. This, yet again, parallels the process of writing and reading literature. Writers create characters and, when they do so, they invent a fictitious past for them. The events recounted in a story may cover hours, days, weeks, or years, but that period is often reconstructed in the reader´s mind in only a few minutes. A consequence of the notion of subjective time is the suggestion that it exists only in the present, the past consisting of present memories and the future of present hopes and fears. This is an idea I share, since the subjective time in my view stretches far into the collective depths of time, and the astral worlds, whose images exist as “relatively valid dreams.” However, to me it still happens in an exchange with an objective existing world, eventually the complete objectivity of the wholeness, which is the Now. That´s what makes perceptions and memories different. Memories, hopes and fears are in my view reactions to the challenges of the now. Perceptions are a mixture of challenges and reactions. I will return to this. In idealism there is no difference between memories and perceptions. Idealism can, as mentioned, not give a philosophical explanation of where the challenges come from, only with religious or pseudoscientific postulates. Borges investigates this in his story “The Other Death,” which alludes to the thesis propounded by the medieval theologian Pier Damiani that, as God is omnipotent, he can make what once existed never to have been. Borges playfully suggests that if the past is constituted solely of memories, then it changes as those memories change. His character Pedro Damián, an Argentine farm labourer, broods all his life on his youthful cowardice during the heat of battle. Borges hypothesizes that in old age Damián managed to change his shameful past: the only surviving witnesses of that battle forget his cowardice and later recall his heroic death leading to a charge as a young soldier. Not all of Borges´s meditations on time have their roots in idealism, but they invariable challenge successive time. In his “The Garden of Forking Paths” the English sinologist Stephen Albert suggests that the Chinese author Ts’ui Pên “did not believe in a uniform and absolute time: he believed in an infinite series of times, a growing, dizzying web of convergent and parallel times.” Yet Borges ironizes this speculation by placing it in a story plot of which is rigidly linear. In “The Theme of the Traitor and the Hero” and “The Plot,” on the other hand, there is a suggestion that time may be cyclical as the Pythagoreans and, later, Nietzsche postulated. The hypothesis that time is circular again has repercussions not only for Borges´s own practice but also for his idea about literature. He suggests that authors do not invent new stories but recycle old ones, and that there is no sense of progress in literature. As for idealist time, his substitution of linear by subjective time parallels his suggestion that it matters less when works were written than the order in which we read them. A further consequence of his questioning of successive time is that as, according to one hypothesis, the past exists only as it is perceived in the present, he can subvert our usual assumption that past writers influence their successors and claim instead, as he does in “Kafka and His Precursors,” that writers create their own precursors in the present. Borges´s fascination with idealism is central to one of his longest stories, “Tlön, Uqbar, Orbis Tertius.” It is a “what if?” think-piece: if the idealists´ speculation really were true, what would a world based upon them be like? It is striking how much it reminds about The Matrix Conspiracy, and it could be taken as an experiential analogy to The Matrix Conspiracy. That´s of course not that strange though, since the main philosophy of the Matrix Conspiracy is idealism, especially Berkeleyan idealism, and all the later versions of it: the New Thought movement, The Brain-in-Jar Hypothesis and the Simulation theory. Tlön, Uqbar, Orbis Tertius is an imaginary place written into existence by a secret society of such philosophers, an early member of which was Berkeley. The project grows over the generations thanks to the munificence of Berkeley´s near namesake, one Buckley, an American millionaire. The story begins with a mirror and an entry into a rogue copy of an encyclopedia, both idealist images: the mirror because what we see in mirrors has no substance but is just a product of our perception, and the encyclopedia because, rather than a work which describes something real, this rogue encyclopedia invents a fictional region called Uqbar. Borges has much pseudo-philosophical fun summarizing this entry and the volume of a subsequent encyclopedia that describes a whole invented planet called Tlön. We are given a synopsis of thought on Tlön, its languages, its heresis, the refutation of those heresies, its mathematics, its literature, and so on. We learn that objects there depend upon being perceived so, in a reductio ad absurdum of idealism, an amphitheater exists only because some birds or a horse visit it (again an example of the poetic beauty in idealism). The southern languages of Tlön contain no nouns because this is a radically anti-materialist world. Things there have no objective existence, but can, somewhat illogically, be manufactured by being imagined (this is precisely what The New Thought movement claims). There is no causality on Tlön because separate perceptions cannot be linked in time; thus a smoldering cigarette, a bush fire, and smoke are not related causally, any connection between them being considered merely an association of ideas. The philosophers of Tlön invent paradoxes in the style of Zeno in which, playing Devil´s advocate, they conjecture that things really do exist independently of the mind, and then find sophisticated arguments to disprove such an outlandish heresy (that is precisely what Quantum mysticism practices). Borges´s humorous account of the Tlönian philosophers´ logic-chopping in an attempt to prove what appears to them as common sense gives us pause as we are invited to question the assumptions we, in turn, make about our own world. In Tlön, as there is nothing outside the perceiving mind, psychology lies at the heart of its culture (well, that´s almost a fact in our own world today – see my article Self-help and The Mythology of Authenticity). This is an interest not in the individual psychology but in the idea that mind is all there is, and the mind in Tlön is just clusters of perceptions. Indeed, one school of Tlönian thought postulates that everybody is really the same mind. The absence of self on the planet has various repercussions; for example, in the planet´s languages the only verbs used are impersonal ones. There is a range of opinion on Tlön about time: for some Tlönian schools of thought time exists, predictable enough, only in the mind and exclusively in the present . [As mentioned I think that the past and the future are reactions to challenges from the Now (which includes what is independent of the ordinary mind). But the past and the future in themselves are the thinking´s past and future, and the thinking can´t be present in the Now. As Kierkegaard says: ”When that to exist (being in the now) can´t be thought, and the existing person yet is thinking, what does that mean then? That means, that he thinks momentarily, he thinks ahead and he thinks behind. His thinking can´t obtain an absolute continuity”]. In the immediate aftermath of the Second World War Borges published his chilling tale “Deutsches Requiem.” The narrator is Otto Dietrich zur Linde, a member of a German military dynasty who explains, on the eve of his execution by the victorious Allies, how he came to run a Nazi concentration camp where he tortured and executed Jewish prisoners. He presents himself as a sensitive and cultured nationalist who found spiritual refuge in music, literature, and metaphysics, although, as often with Borges´s first-person narrators, we become aware that he is deceiving himself as well as us. Zur Linde´s interest in Schopenhauer led him to abandon Christianity, and when he read Nietzsche – or at least the Nietzsche of the Nazis – he not only made some of that philosopher´s views his own, but acted upon them, cultivating ruthlessness. His account is shot through with the language used by Schopenhauer, Nietzsche, and Spengler, and with his selective understanding of their writings which, like a religious zealot, he applies uncritically to his own life. For example, he maintains that everything we do and experience is preordained and willed by us; he considers himself a superman; his attitudes are those of a warrior caste, and he learns to exalt war and violence; he admires strength of will above all else, despising and overcoming the weakness of compassion which he claims was natural to his character and which Nietzsche had identified with a “slave mentality”; and, perversely, he exults in the destruction of what he holds most dear: Germany. He finds justification for this in an apocalyptic vision, partly absorbed from Nietzsche and Spengler, in which violence and destruction are to be welcomed because a new order will arise from the ashes.